In three of my incarnations past (one in early teenage-hood, two in adulthood) I’ve resided in the self-declared centre of the Canadian universe: Toronto (and its suburban environs). Thanks to the patience and persistence of my boyfriend at the time of one of those residencies, I – very belatedly – learned to ride a bike on Toronto Island. On the other hand I never learned to skate. When my family emigrated to Canada, more years ago than I shall ever disclose, we landed in Sault Ste. Marie. When we emigrated, we had no immediate family here. But, not long after we landed, word got around (although, to this day, I’m not quite sure how!) that there was a new Jewish family in town. So we became acquainted and life-long friends with a “clan” whose lives intertwined with my own – and who, in effect, became our extended family away from home. Their matriarch, an extraordinarily wonderful woman whose selfless deeds touched so many lives (including mine) passed away, in Toronto, on New Year’s day. As often happens when one loses a member of one’s family, one thinks back on that person’s life – and on one’s own. So I was reminded of our early days in Canada, particularly the two years we had lived in “the Sault” and of my failure to learn to skate! For our first Chanukah here, my parents had given skates to my two younger sisters and me. Perhaps to make up for the fact that reality did not quite match the promised “lake in every backyard” one might have expected from the promotional material we had received prior to emigrating, my father had created a skating rink in our backyard. And we three very warmly-clothed girls laced up our skates and ventured onto the ice. We all fell down … several times! Eventually, my two sisters were skating like pros (or so it appeared to me); but, after several falls, I determined that God must have passed me by when She handed out the skating genes! The ice on Lake Ontario sparkles in the afternoon winter sun. Alec Farquhar, his wife Kathleen McDonnell and I pivot on our skates and speed north. Ahead of us, across the frozen lake, bristle Toronto’s towers. Our skates bounce on bumpy patches and slow down over snow drifts. We come to open, smooth ice, longer than many rinks. We glide to and fro, swirling and smiling and enjoying the great outdoors. Some in Toronto complain when the thermometer dips to -26C, as it did outside my kitchen window Friday morning. Not me. “Cold Weather Alert?” Count me in. Cold weather means natural ice. On Friday I buy a $7 ticket on the 12:30 p.m. boat from the Jack Layton Ferry Terminal to Ward’s Island. The little Ongiara, the only ferry that runs through winter, labours to plow through a channel of ice chunks. Mr. Farquhar meets me at the dock. We walk to his cozy island home to pick up his family. Then we walk west across Ward’s Island to Algonquin Island. We each carry a hockey stick. No one brought a puck. The sticks are to help us, should we fall through. But there is little danger: I can see along a seam that the ice is 30 cm [11.8″ -hro] thick. A century ago Toronto held fancy-dress balls in pavilions on the ice of Toronto Harbour. Sure, the climate has changed. Still, on a cold winter like this, it behooves us to find a way to (safely) embrace the pleasures of natural ice. Meanwhile, there are a number of ongoing concerns deriving from the (no doubt unintended) consequences of what some have dubbed the journey of the Clitanic, but what I prefer to think of as Turney’s Ice Follies. Chris Turney is a “Professor of climate change” – and someone whose name may have been relatively unknown and unheard of prior to December 24 (except, perhaps, to Steve McIntyre who recently recalled that Paul Matthews had observed that Turney and Joelle Gergis were the “leaders” of the Australian part of the ‘made to IPCC order’ PAGES 2K consortium. If for some reason you’ve missed the coverage of the fallout from Turney’s Ice Follies, you would do well to start at Anthony Watts’ WUWT. Shub Niggurath’s documentation of the “fateful moment” that should forever be an albatross around Turney’s neck is also definitely worth a read. And when even the NYT’s Andrew Revkin is critical of this PR stunt on natural ice, you know that Turney is in big trouble. Perhaps bigger than Turney will ever admit to himself or anyone else. The plight of these latter-day sojourners — a mix of scientists, grad students, tourists, and of course the Russian ship’s crew — is at best a sad and diminished echo of the great epoch of polar exploration. So little is really risked, and so little gained — the expense of evacuating the passengers will far outweigh any small gains to science — I can only think that Mawson, for whom the struggle was quite literally one of life and death, would be turning in his grave. The debacle in the Antarctic ice is probably the largest setback for global warming campaigners since Climategate scandal in 2009. […] the episode is a setback for those making the case for what used to be called global warming – probably the largest such setback since emails stolen from the University of East Anglia in 2009 cast doubt on the scientific neutrality of several climate researchers. […] The voyage of the Akademik Shokalskiy mixed public and private purposes, and all such enterprises nowadays invite scepticism. Those who stood to reap the benefits of the voyage were able, when things went sour, to pass on many of the costs. Had this incident transpired a few weeks earlier, I’m quite sure that Turney would have been the hands-down winner of the Pointman’s Climate Prat of the Year award. But, alas, Turney was then so unknown he didn’t even make the cut onto the list of nominated candidates. As I was virtually skating down memory lane during the course of writing this post, I was reminded of a feat I actually did accomplish when we lived in the Sault. This was, of course, in the days when one learned that carbon dioxide was essential for life on earth – not the dreaded demon that “climate scientists” (and/or politicians) turned entrepreneurs with vested interests, such as Turney, would have us believe. Back in those days, the U.K. Guardian was still a respectable newspaper with real journalists, not the third-rate tweeters they embed in expeditions such as Turney’s Ice Follies – nor the likes of Suzanne Goldenberg, Leo Hickman and Damian Carrington. And definitely not self-glorifying PR hacks, such Alexander White who proudly brags about having been “personally trained by the Hon. Al Gore in 2009” – and who seems to hold a view of a rather totalitarian bent to the effect that the voices of skeptics should not be heard. In those days, boys took Woodworking classes while girls took Home Economics. 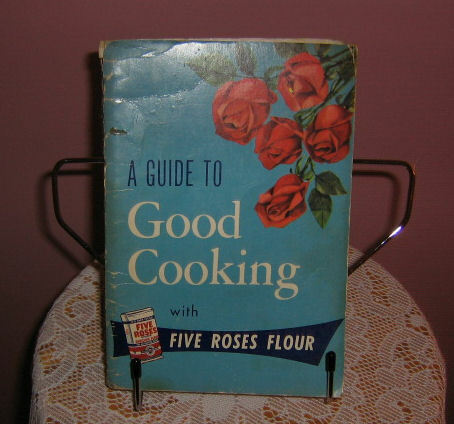 Believe it or not, I still have the $0.50 “A Guide to Good Cooking with Five Roses Flour” that was the “textbook” for the “cooking” portion of this class! As part of the “Home Ec” curriculum, we girls were required to make a skirt. We did have the assistance of sewing machines and I distinctly recall that I succeeded in making a bright red flared skirt. It was the skirt I wore (along with bobby socks and saddle shoes I suspect!) to the first live concert (well, that’s all we had in those days!) I ever attended: a performance by the then very popular Everly Brothers, Don and Phil. So I was sorry to learn on Friday that Phil, the younger of the duo, had passed away. But this sent me off to the ‘Tube in search of melodies (and more fond memories) past. I didn’t get to see this live reunion concert when they performed at London’s Royal Albert Hall in 1983; but I certainly did enjoy listening (and singing along!) while I was writing this post – so I thought I’d share it with you. Happy New Year … and enjoy! So sorry to hear of your loss, Hilary. In my experience, difficulty in skating comes from treating it as a form of walking or running. It is not. It is sliding, on one foot at a time (when not just coasting). The other foor pivots sideways to push. Using figure skates is somewhat different, as the “toe pick” allows you to push without pivoting, but the “sliding on one foot” is still the key skill. Thanks Hilary. I grew up in the English Midlands. We learned metalwork at school: woodwork was for gurlz. We had a fully equipped machine shop, lathes, a milling machine, a surface plate etc. My special joy was blacksmithing. Heating steel in a forge and shaping it with a hammer on an anvil. My nephew finished school about 10 years ago. They had a metal workshop too, but they weren’t allowed to use the tools. The closest he got to practical experience was writing a report on how he would use the tools to make a job. I doubt you would be allowed to use a sewing machine either. Elfinsafety ‘an that. Turney’s’ Ice Follies,’ Hilary, so apt. H/t Kim @ Climate Etc.